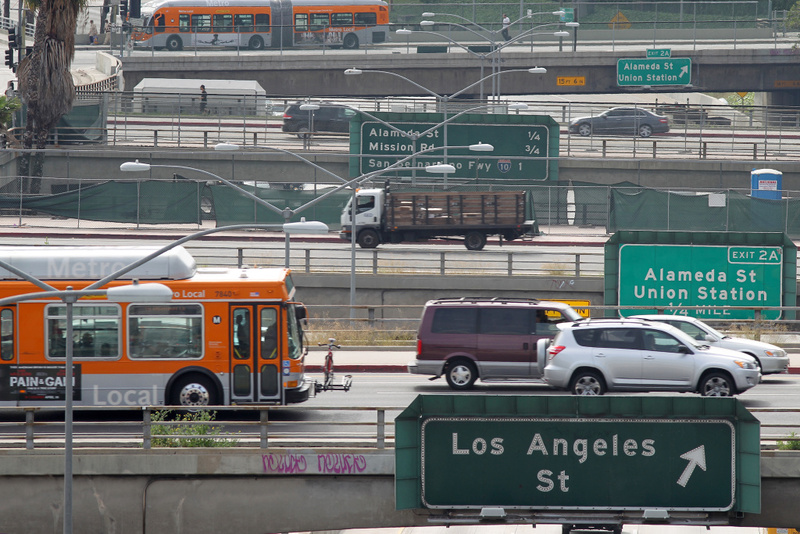 LOS ANGELES, CA - APRIL 25: Surface street traffic corsses above the US 101 freeway on April 25, 2013 in Los Angeles, California. The nation's second largest city, Los Angeles, has again been ranked the worst in the nation for ozone pollution and fourth for particulates by the American Lung Association in it's annual air quality report card. Ozone is a component of smog that forms when sunlight reacts with hydrocarbon and nitrous oxide emissions. Particulates pollution includes substances like dust and soot. The end of October marks the end of the smog season in Southern California. By some standards, this year was an improvement over the recent ones, with 2014 coming in with the second fewest ozone exceedance days in the past 20 years. Despite that, persistent high levels of ozone in the region led four health and environmental groups to file a lawsuit on Friday against the U.S. Environmental Protection Agency for failing to take stronger steps to reduce the pollution. The plaintiffs include Communities for a Better Environment, Physicians for Social Responsibility-Los Angeles, Sierra Club, and Natural Resources Defense Council. “Health groups and environmental groups are getting increasingly frustrated with these plans and their inability to clean the air,” said Adrian Martinez, staff attorney for Earthjustice, which is representing three of the plaintiffs. Martinez said that the EPA failed to protect local residents in September when it approved a smog reduction plan submitted by the South Coast Air Quality Management District. He said that the plan doesn’t provide enough concrete steps to achieve reductions in ozone and other smog precursors. “It just doesn’t really show us how we’re going to get to cleaner air in the region,” Martinez said. At the heart of the lawsuit is a perceived loophole in the Clean Air Act that allows for areas considered to be in extreme non-attainment with acceptable pollution levels to credit untapped new technology with future reductions. Martinez said that consideration allows too much leeway when it comes to actual planning. He said the plaintiffs’ goal is to make the EPA obtain a new reduction plan from the AQMD. “If the groups are successful, it will be a major victory for clean air, because it will finally force the region to show how it’s going to bring cleaner air for everyone,” Martinez said. AQMD officials said that 40 percent of planned reductions to ozone levels have been attributed to future technologies. However, they said many of the technologies are actually being developed or implemented. Cassmassi said that major steps have already been taken to reduce ozone pollution in the air basin. “We’ve got the strictest rules for stationary sources in the world. There’s nobody that has more strict rules or regulations than we do. We have an exemplary enforcement group that goes out and monitors all of our sources,” Cassmassi said.